1. Preheat the oven to 200⁰C, gas mark 6. Heat a tablespoon of olive oil in a large pan on a medium heat. Add the garlic and cook for a minute until pale golden. Add the oregano and tomatoes and simmer slowly for 15 minutes. Season to taste. 2. Meanwhile, toss the aubergines and onion with the remaining oil and place in a single layer in a roasting tin. Roast for 15–20 minutes until browned and tender. 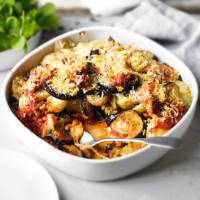 In a deep dish, layer the tomato sauce followed by a layer of aubergines and then potatoes. Scatter with the mozzarella. Repeat until you’ve used up all the ingredients, finishing with a little sauce. Scatter the top with the breadcrumbs and Parmigiano Reggiano. Bake for 50-60 minutes until the potatoes are tender. Serve with a green salad. This recipe was first published in Tue Aug 05 10:47:00 BST 2014.